ABOUT: Mount Wilson is a fascinating place for photography, particularly of the tree lined roads in the town – this lookout is just next to the village fire station. 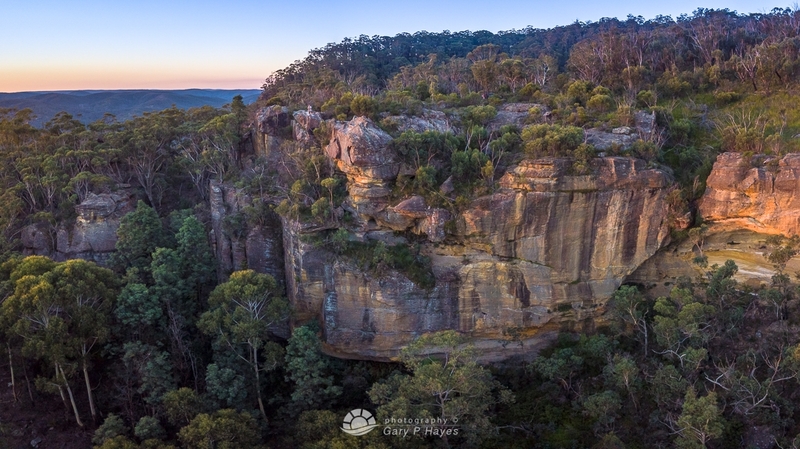 It provides wonderful views over the high wilderness back towards Bells Line of Rd and rocky outcrops to the left and right down into the Wollamgambe Canyon. The various foreground rocks are impressive and great for foreground as the sun sets directly opposite the lookout. PHOTO EQUIPMENT TO BRING: Moderate wide angles 24-35mm range and tripods with a good neutral density graduation filter kit most useful. GETTING TO THE SPOT/S: Drive towards Mount Wilson and at the fire station as you enter the village make a left turn, you can drive down to the actual lookout park or park at the top and walk down.